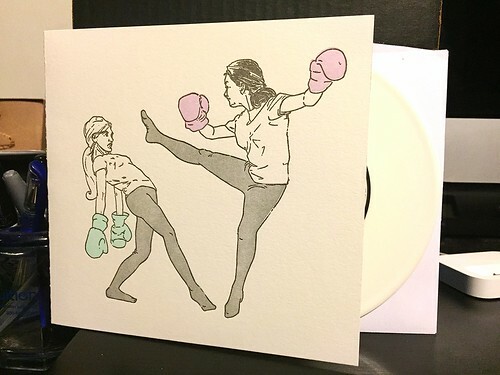 This split 7" was one that I received to review and I was immediately taken with the artwork. It may not really look like much in the picture, but the quality of the sleeve is outstanding. It's printed on really thick card stock and all of the images and text have a raised, embossed feeling to them. Pretty top notch. The bands themselves don't impress as much as the art does. First up is Color Animal. They contribute two indie pop songs that are OK. The problem with both is they sound like they are building to a big catchy hook that never actually arrives. I think you should only be allowed to repeat a guitar riff a limited number of times before you are required by law to hit that hook. Again, both songs are OK, but it would have only taken a catchy chorus to make them stand out. On the flip side is Magic Mint. They suffer from a similar malady; the chorus just never seems to arrive. It's significantly less poppy that the Color Animal songs, leaning on a repetitive, dreamlike vibe and washed out vocals. It's not as good as Color Animal as once you get a little too far out there with your atmospheric sounds, you will inevitably lose my attention. But again, the artwork is pretty great.